Temperature matters when you're managing a cold storage facility. Various products require different temperatures, and it's critical that your storage areas maintain consistent conditions to ensure product quality. However, there are numerous obstacles when dealing with cold storage areas. Low temperatures can have a negative impact on electronics and equipment, causing them to run slower or not work efficiently. Forklifts are no exception. Here are a few tips you can employ to keep the lift trucks in your cold storage facility in good condition. Cold temperatures decrease battery life of anything electronic. 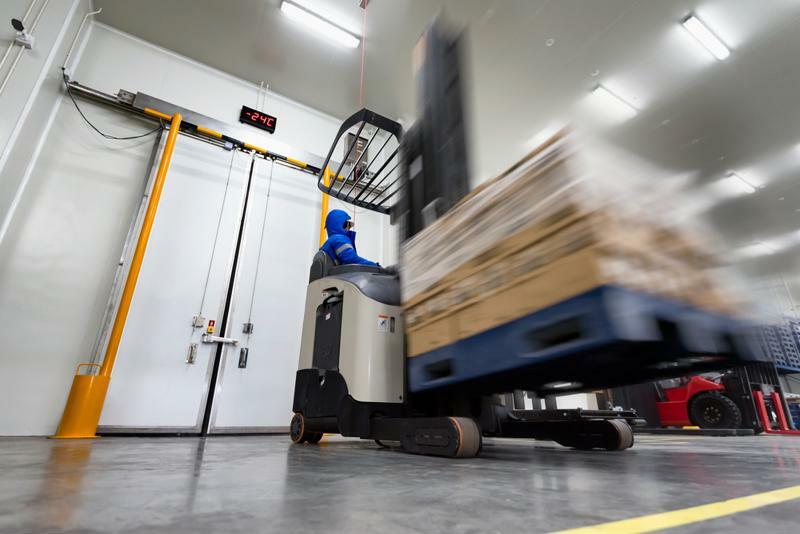 For forklifts operating in cold storage, the life cycle and rate of charge can decrease by 20 to 50 percent, according to Modern Materials Handling. To contend with this challenge, make sure you have a consistent recharging schedule for your forklift batteries. Additionally, investing in higher-voltage batteries that have a longer run time can also reduce challenges with dying batteries. Cold storage forklifts require specialized maintenance. Condensation is a major concern in facilities where forklifts are frequently traveling from cold to warm temperatures. Water droplets can compromise the forklift's wire harness and negatively impact the connectors, Food Logistics noted. If your forklifts are not designed to handle the cold, it could mean you'll have to change the batteries out more frequently, halting operations and increasing downtime. Making sure you're using connectors that are well sealed can help keep your forklift running. The wrong tires will struggle to drive over icy or cold surfaces and could be prone to ice buildup, so choose tires specifically created for cold temperatures. Cold-prepped tires are manufactured with a unique surface that's designed to reduce moisture buildup, which prevents ice formation. Just like your employees need a break from the frigid temperatures once in a while, your forklifts will benefit from the chance to thaw. Try to store and charge your forklifts in warmer temperatures when they're not in use. However, avoid major temperature changes. Slow transitions will minimize condensation. Additionally, don't move a forklift from a warm environment to a cold one when it still has condensation on it. The condensation will freeze and present a whole new set of issues to deal with. As with any other piece of equipment, one of the best ways you can prevent breakdowns is through periodic inspections and regular preventive maintenance. Be sure to give your cold storage vehicles adequate attention and address any forklift maintenance challenges as they occur. Working with a dedicated technician can help you stay on top of inspections and repairs. National Maintenance Services will assign an on-site technician who will keep a close eye on all your cold storage forklifts and other equipment in your operation to ensure it's reliable for your team. To learn more, reach out to NMS today.